Dr. Jaga Jeevan Babu Geddam is currently heading the Division of Clinical Epidemiology. He did his MBBS degree from Ranga Raya Medical College, of Andhra University, and MPH from Royal Tropical Institute, Amsterdam of VU university of Netherlands. He was the awardee of NUFFIC fellowship of Govt of Netherlands in 2008. He has about 23 years of research experience in the field of clinical epidemiology emphasis adolescent and migrant’s health and nutrition. He has published more than 40 scientific papers in national and international peer-reviewed journals. 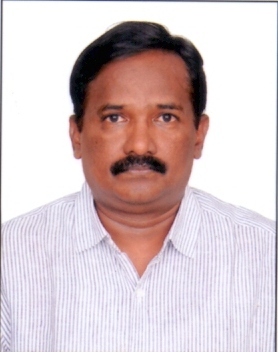 He is the Project Incharge for the Model Rural Health Research Center (MRHRU), Chandragiri, Chittoor District AP and, Mentor for Model Research Unit (MRU), SV medical college, Tirupati, AP. Babu BV, Sharma Y, Kusuma YS, Sivakami M, Lal DK, Marimuthu P, Geddam JB, Khanna A, Agarwal M, Sudhakar G, Sengupta P, Borhade A, Khan Z, Kerketta AS, Brogen A. Internal migrants' experiences with and perceptions of frontline health workers: A nationwide study in 13 Indian cities. Int J Health Plann Manage. 2018. doi: 10.1002/hpm.2538. Suryanarayana P, Arlappa N, Sai Santhosh V, Balakrishna N, Lakshmi Rajkumar P, Prasad U, Raju BB, Shivakeseva K, Divya Shoshanni K, Seshacharyulu M, Geddam JB, Prasanthi PS, Ananthan R. Prevalence of vitamin D deficiency and its associated factors among the urban elderly population in Hyderabad metropolitan city, South India. Ann Hum Biol. 2018;45(2):133-139. Satyendra NathPonna , Venkata Prasad Upadrasta , J. J. Babu Geddam , Shankar Reddy Dudala1,, Renuka Sadasivuni1 , Hemalatha Bathina1Regional variation in utilization of Antenatal care services in the state of Andhra Pradesh . J Family Med Prim Care. 2017 Apr-Jun;6(2):231-23. Raja Sriswan Mamidi, Hemalatha Rajkumar, K. V. Radhakrishna, and J. J. Babu: Secular Trends in Heights and Weights in Boys and Girls Over 3 Decades in Rural India. Food Nutr Bull. 2016 May 13. Jagajeevan Babu Geddam, Suresh Babu Kokku, Balakrishna Nagalla, Anupama D, Radha Krishna Kankipati Vijaya, Ajeya Kumar Parttipati. Diet, nutrition and cardiac risk factor profile of tribal migrant population in an urban slum in India. Indian Journal of Community Health, 27, 01; 2015. Khandare AL, Babu JJ, Ankulu M, Aparna N, Shirfule A, Rao GS. Grass pea consumption & present scenario of neurolathyrism in Maharashtra State of India. Indian J Med Res. 2014 Jul;140(1):96-101. J. J. Babu Geddam, Y. Thimma Reddy, N. Balakrishna, Sunil Kumar Reddy2, P. Ajay Kumar, K. V. Radhakrishna Osteoporotic hip fractures in low-income group population, hospital based case control study from India. International Journal of Medicine and Public Health, 2014, 4, 4. Aggarwal R, Babu JJ, Hemalatha R, Reddy AV, Sharma D, Kumar T. Effect of inclusion of hepatitis B vaccine in childhood immunization program in India: a retrospective cohort study. Indian Pediatr. 2014 Nov;51(11):875-9. K. V. Radhakrishna, R. Hemalatha, J. J. Babu Geddam, P. Ajey Kumar, N. Balakrishna, and Veena Shatrugna. Effectiveness of Zinc Supplementation to Full Term Normal Infants: A Community Based Double Blind, Randomized, Controlled, Clinical Trial. PLoS One. 2013; 8(5): e61486. Babu Geddam JJ, Radhakrishna KV, Ramalaxmi BA, Ravinder P, and Balakrishna N. Expression of Leptin In Early Placental Development- Its Association With Maternal Nutritional Status. International Journal of Medicine and Public Health,2012,2,3,21-24. Mamidi RS, Shidhaye P, Radhakrishna KV, Babu JJ, Reddy PS. Pattern of growth faltering and recovery in under 5 children in India using WHO growth standards--a study on First and Third National Family Health Survey. Indian Pediatr. 2011, 11;48(11):855-60.